Violinist Sunho Kim joined the Kansas City Symphony in 2008, and holds the position of assistant concertmaster. Prior to joining the Kansas City Symphony, she was a fellow of the New World Symphony from 2005-2008, and she served regularly as a concertmaster under Michael Tilson Thomas. 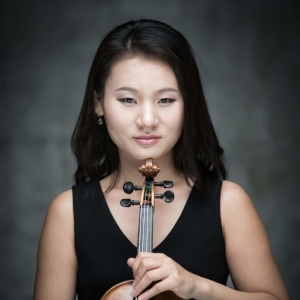 The winner of the Heino Eller International Violin Competition in Estonia and Bales Violin Competition in Boston, Kim made her solo debut at age 14 with the Seoul Philharmonic Orchestra as a winner of Seoul Phil Young Artist Competition, and she also has been a featured soloist with the Kansas City Symphony, Estonian National Symphony, Danish Free Mason Orchestra, Seoul Symphony and Seoul Youth Chamber Orchestra, among others. An avid chamber musician, Kim is seen frequently in the Kansas City Symphony’s free Happy Hour chamber music concerts with her colleagues, and she has performed at the Colorado Music Festival, Yellow Barn Chamber Music Festival, Summerfest in Kansas City, Savonlinna Chamber Music Festival in Finland and Shanghai International Music Festival. She was a founding member of the Tappan String Quartet and has performed with them at the Smithsonian American History Museum. She also has performed solo recitals in Germany, Denmark, Czech Republic, South-Korea and the United States. Originally from South-Korea, Kim moved to Germany at age 16 to study with Mi-Kyung Lee at the University of Arts, Berlin, and continued her study with Milan Vitek, first at the Royal Danish Academy of Music and completed with an Artist Diploma at the Oberlin Conservatory. She received her master’s degree from the New England Conservatory as a student of Masuko Ushioda.